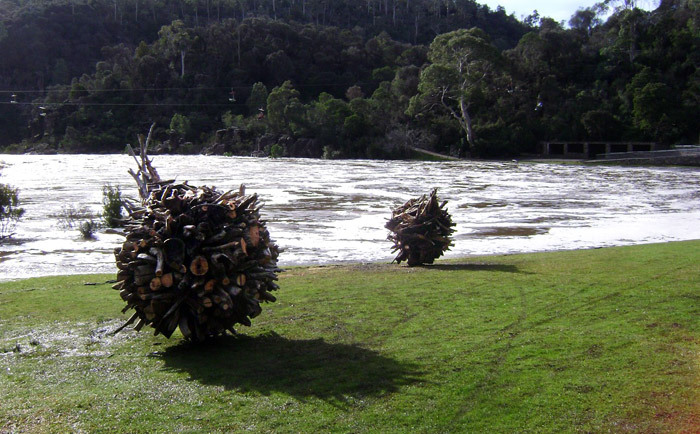 Constructions of driftwood found at the basin of Cataract Gorge are created on the shore near where these great piles of wood are washed up. 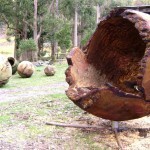 ‘Squall’ is a representation of the elements that we cannot ignore when at Cataract Gorge. Drops are hurtling around in all directions, there is a sense of chaos in the First Basin environment. Several driftwood posts are placed into the earth as in constructing stock fences. These posts act as uprights within which to hold a large volume of driftwood. Steel and Fencing wire are tensioned off the uprights to enable driftwood pieces to be attached as further structural reinforcement. The driftwood is stacked and tied into the uprights, a crafting technique hides the structural uprights. The geometric form of the stacks is the environmental symbol that reads ‘nature’ to every viewer. 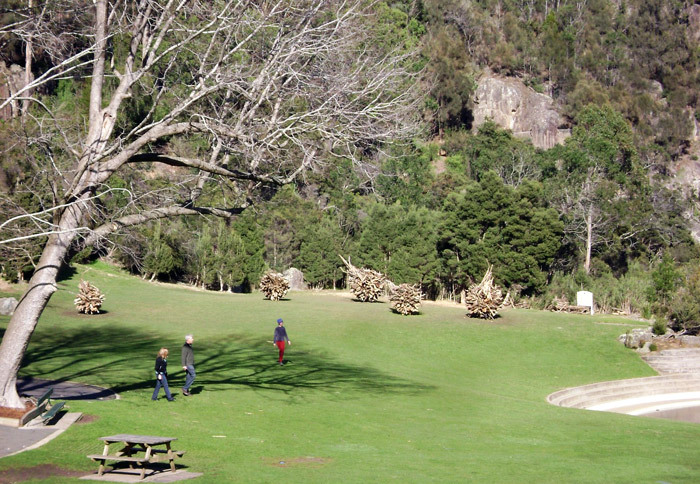 The exhibit at the Basin was to invite Conference delegates to walk from Launceston City into The Cataract Gorge. During ‘Squall’s construction, visitors got to see the artist working with found materials in creative ways. One of the volunteers worked as a publicity officer to distribute information about the conference and the scope of the Junction2010 Festival. 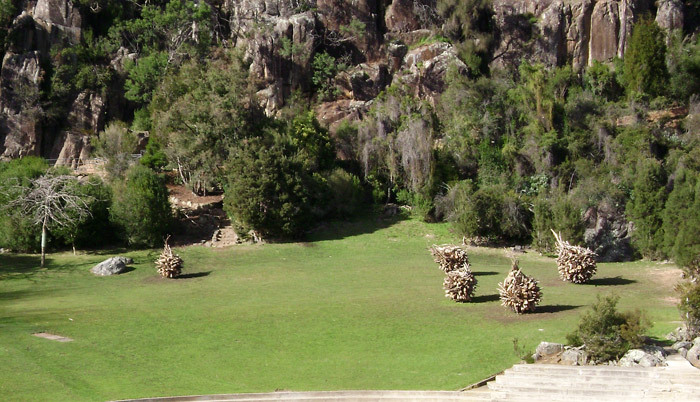 The site at the Gorge is prone to severe vandalism as it is an unsecured public place. Seasonal deposits of driftwood form in specific parts of the Basin each year. These build ups, primarily after flooding, are consistently removed by local pedestrian visitors to the Gorge. Launceston City Council manages the build ups of the materials but rarely finds the need to remove driftwood itself. 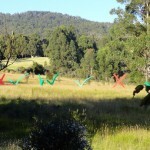 It is thought that the sculptural intervention can enhance the Gorge experience for the locals over several months. Essentially it makes gathering of wood easier for locals who would otherwise have to pull pieces from the water themselves. The wood is raised from the ground, starting the drying out process. Locals are able to systematically unstack the wood and walk it home where it will warm homes and the families within. Unless there is a flood!! !